With a total of 75 exciting new designs added to these updated collections, the Expona Commercial luxury vinyl tile collection and the Expona Simplay range of loose lay luxury vinyl tiles are designed to bring style and robust performance to high traffic commercial interiors in the retail, leisure, office, education and healthcare sectors. The Expona Commercial range now features 80 inspiring wood, stone and abstract effect designs, 55 of which are brand new additions to the collection. 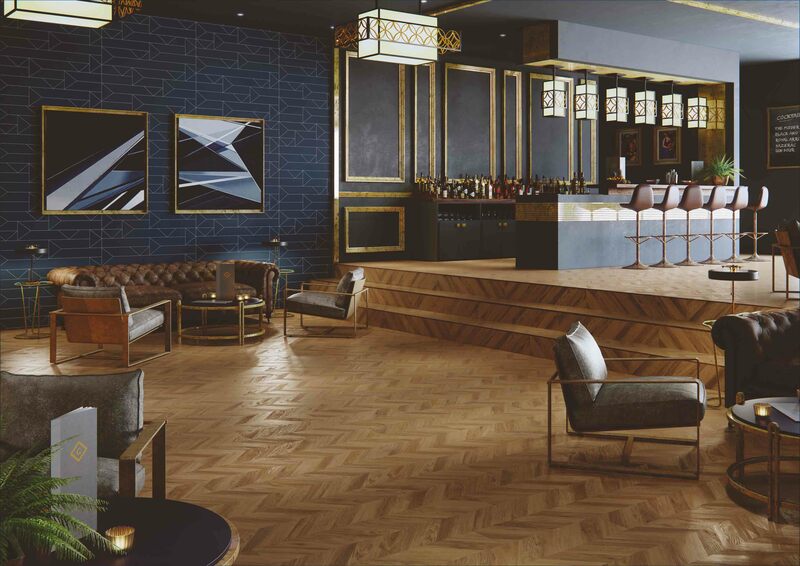 With new parquet, painted, mosaic, rustic and metallic effects, Expona Commercial LVT can be used to create adventurous interior schemes featuring bold statement flooring designs which tap into the latest architectural trends. Stunning yet subtle flooring designs in more traditional reproductions of natural materials give balance to this varied collection of 2.5mm gauge luxury vinyl tiles. Making it easier to create a striking design floor, the Expona Commercial range now features more out-of-the-box design floor options which are straightforward to install, including beautiful chevron and woodblock patterns. Larger format planks are also available in an 8” by 60” size that is unique to the LVT market. A selection of Expona Commercial designs also feature an aligned surface emboss which marries up with the decorative layer for added realism. The Expona Simplay collection of loose lay vinyl tiles and planks now offers 40 authentic wood, stone and textile effects presented in an adhesive-free, ready to lay product designed to reduce installation time. Each plank or tile can be installed, lifted and reinstalled elsewhere without leaving any residue, with the product’s unique, non-skid honeycomb backing layer and thicker 5mm gauge ensuring that the tiles stay in position. The 20 new designs within the collection include on-trend concrete, marble and vintage wood effects alongside three larger format Mono designs. The whole collection now also features bevelled edges. Tom Rollo, Polyflor’s Marketing Manager commented, “We wanted to continue the evolution of our renowned Expona brand with the high-profile relaunches of Expona Commercial and Expona Simplay, adding fresh new and on trend designs that are unique to the market. The Expona luxury vinyl tile offer, which also includes the Expona Bevel Line, Expona Design and Expona Control ranges, now features an impressive total of 189 different LVT design options”. The complete Expona Commercial and Expona Simplay collections are showcased within brochures, presenters and shadecards. Sampling from all Expona ranges can be ordered free of charge on the Polyflor website or by calling the Polyflor Samples Direct Hotline on 0161 767 2551. Expona Commercial and Expona Simplay luxury vinyl tiles contain recycled material and are 100% recyclable via the Recofloor vinyl take back scheme.